April 22, 2011 “Bird in the Hand”: Banding gives researchers a wealth of information, from reproduction to migration, and local students get in on the act. Medford Mail Tribune. By Bob Frey, KBO Biologist and Banding Project Leader Remember Flower Power – a slogan used as a symbol of passive resistance and non-violent ideology in the 1960s? The Golden-crowned Sparrow (Zonotrichia atricapilla) is a big believer— flowers are very nearly all it eats! Studies have found that plant material makes up 95% to 97% of this songbird’s natural diet, with flowers comprising up to 50% of this. This large sparrow of the north country nests exclusively in Alaska and western Canada, on the ground in habitats above the treeline. It is found in western California, Oregon, and Washington only during the winter, spring, and fall seasons. The Golden-crowned Sparrow is a common feeder bird, though preferring to forage on the ground, often flocking with other sparrows. Dark-streaked brown upperparts, light-brownish underparts, a long tail, and a distinctive yellow (golden) crown distinguish it from others in the lowland brush or field edges it frequents. The yellow crown is bordered with dark stripes and is most bright in mature individuals. The scientific genus name Zonotrichia is Greek for “bird with bands,” an allusion to the crown stripes – from zone for band (or stripe), and trichias for small bird. The species name atricapilla is Latin for “black hairs”, coined from ater or atri for black and capillus for hair, referring to the black bordered crown. Although there is some evidence of this species increasing in number, there is concern that not enough is known, and that monitoring is insufficient in its northern range—an important challenge for researchers and land managers. The data that KBO collects from Golden-crowned Sparrows captured in the Klamath-Siskiyou Bioregion during the migration and winter seasons contribute greatly to our understanding of this species’ conservation status in North America. Sources: Marshall et al., eds. 2003. Birds of Oregon: A general reference. Oregon State University Press, Corvallis, Oregon; Gruson 1972. Words for birds: A lexicon of North American birds with biographical notes. Quadrangle Books, Inc., New York, New York; Martin et al. 1951. American wildlife and plants: A guide to wildlife food habits. Dover Publications, Inc., New York, New York; Rich et al. 2004. Partners in Flight North American Landbird Conservation Plan. Cornell Lab of Ornithology, Ithaca, New York. This article appears in KBO’s Spring 2011 Newsletter. The Klamath Bird Observatory is looking for volunteers for a pair of field trips. These trips will take place on May 20th and May 21st for fourth/fifth grade students and third grade students respectively. These trips will make up KBO’s fourth season of coordination with Chiloquin Elementary to take students to such locations as the Upper Klamath Lake and Wood River Wetland. More can be read on My Outdoor Buddy’s website. Great Blue Herons Return to Breeding Colonies. Press Release. March 29th, 2011. “Homing in on Herons: Biologists will survey Great Blue Heron rookery sites in Southern Oregon and statewide to see how the species is doing.” Medford Mail Tribune. April 4th, 2011. During the spring and summer many birds are migrating thousands of miles and often right over our homes. Along the way birds use “rest stops” to eat food, drink and rest. Migration itself is the most dangerous part of a bird’s life but now, with ever changing landscapes many places that used to provide birds with food, water and shelter along their journey are drained, paved and developed. Landowners play a significant role in protecting habitat and bird populations. About 50% of the land in the Western U.S. and 80% in the Great Plains is privately owned. Klamath Bird Observatory’s director John Alexander says “Just having hedgerows, diversifying crops, or changing when you mow can make a difference.” Because each species of bird has its own specific needs, no matter what type of landscape you have it can probably be used by birds. Planting native, seasonal species and flowering plants can provide substrate and food for many species. To read the full article in the John Deere magazine Homestead and to learn more about what you can do to help improve your yard for bird habitat click here. The US Forest Service’s Wings Across the Americas Program has recently awarded John Alexander, KBO’s Executive Director, an international award for bird conservation. The Klamath Bird Observatory has been active not only in the Klamath-Siskiyou Bioregion, which makes up parts of southern Oregon and northern California, but also has partnered with Costa Rica Bird Observatories to improve bird monitoring in the new world tropics. Establishing these sorts of observatories in Latin America, where many migratory birds spend the winter, has expanded the reach of bird conservation efforts significantly. For more information, read the press release, or one of these articles in The Oregonian, Medford Mail Tribune, orAshland Chamber of Commerce website. Klamath Bird Observatory’s executive director John Alexander has recently been awarded for his years of effort in conservation through international partnerships. The U.S forest service awarded him the Wings Across the Americas award, recognizing the partnership between KBO, Instituto Nacional de Biodiversidad in Costa Rica and Dr. C.J Ralph of the U.S Forest Service in Arcata, CA. Through their efforts many Latin American biologists have been brought to the Klamath-Siskiyou bioregion for an extensive six month bird banding training. The trained biologists are then able to use these skills back home to help expand the network of scientists throughout the Americas. 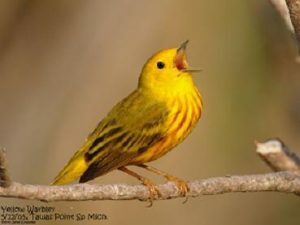 Data collected through this partnership will help computer modeling tools show projections of how birds will likely react to changes in climate, the environment and land use in the future. The goal is for these tools to help public land agencies make decisions about land use practices. Many of the species seen here in the spring and summer are migratory, therefore conserving habitat in Latin America not only benefits the endemic birds found there, but also the migrants we commonly see here. To read the full article and learn more about what Klamath Bird Observatory and its partners are doing, click here. The analysis of toenails and feathers may provide clues to where birds, such as song sparrows, spend their winters. Barbara Massey and staff of the Klamath Bird Observatory spent last spring collecting these tissue samples, which they hope will answer this question through analysis of hydrogen levels. As Barbara explains in an article for the Ashland Daily Tidings, birds will pick up different hydrogen levels depending on where they are living. The full article can be read here. The Mail Tribune recently posted an announcement concerning a workshop that the Klamath Bird Observatory will be hosting on October 19th and 20th. Meeting at this workshop will be climate change scientists, biologists, educators, and land managers from a variety of institutions. The workshop will be held at the Best Western Windsor Inn. The full announcement can be read here. The Klamath Bird Observatory and its supporters will meet Sunday for the Wings and Wine Gala at Hanley Farm. The gala will raise money for the observatory, which collects data regarding local bird populations and, though that data, examines the health of the ecosystem. All of this makes a big difference to land managers, who can use the KBO’s data to understand how bird populations might be effected by their decisions. John Alexander, executive director of the KBO and CJ Ralph have received the Partners in Flight Leadership Award. For more on the Wings and Wine Gala and the Klamath Bird Observatory, check out the article on the Medford Examiner’s website.